Here is a easy way to make delicious plant-based pizza. Pre-heat oven to 425 degrees. Prepare two cookie sheets lined with parchment or silicone sheets. Crust: I like to use Vicolo’s Gluten-free Corn Meal Crusts which I buy at Whole Foods. They are organic, non-GMO and delicious. There are two to a package so buy 2 each for this recipe. You can also make your own dough of course. Place the onions and mushrooms on the other cookie sheet and drizzle with 1 Tablespoon EVOO. Sprinkle with the seasonings and salt and pepper and stir. Remove the skins from the peppers and eggplant. Remove any seeds and slice. 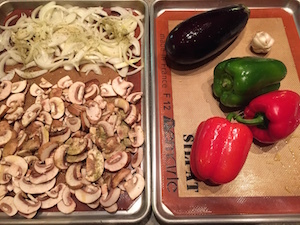 Add the onions, garlic, bell peppers, eggplant, mushrooms, tomatoes and olives. Have fun and be creative. Remove from oven, top with fresh basil, slice and enjoy! The pizza is great served with minestrone soup and a big green salad.